General Robert E. Lee's first invasion of the North was a huge gamble that held the potential of very great rewards. Lee's campaign could win Maryland for the Confederacy, earn diplomatic recognition from Britain and France, and perhaps even force the Union to sue for peace. It would also take his troops out of war-ravaged Virginia during harvest time, and enable his troops to live off the enemy's country for a while. Following his victory at the Second Battle of Bull Run Lee led his ragtag army northward across the Potomac River and into Union territory. The two armies met in the Maryland farm fields bordering the trickling Antietam Creek near the town of Sharpsburg. The Union named the conflict the Battle of Antietam in honor of the creek while the South called it the Battle of Sharpsburg in honor of the town. From dawn till dark on the 17th the two armies threw frontal attacks at each other, littering the fields with their dead and wounded. "The whole landscape for an instant turned red," one northern soldier later wrote. Another veteran recalled, "[The cornfield] was so full of bodies that a man could have walked through it without stepping on the ground." No clear victor emerged and the fighting stopped out of shear exhaustion. 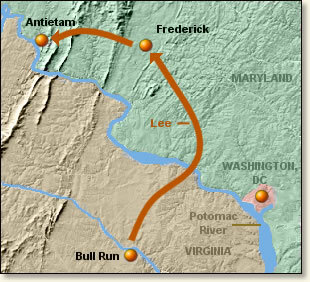 Lee withdrew during the night of September 18, and re-crossed the Potomac. Tactically, the battle ended in a draw. Strategically, it was a victory for the Union. Some of the day's most brutal combat occurred during the late morning along a sunken road held by the Confederates. For two and one half hours Union troops threw themselves at the entrenched Confederates finally dislodging them. The murderous fire from both sides left the battlefield strewn with corpses giving the road the name "Bloody Lane." Lt. Frederick Hitchcock was a member of the 132d Pennsylvania Volunteers and experienced his first combat that day. Soon we began to hear a most ominous sound which we had never before heard, except in the far distance at South Mountain, namely, the rattle of musketry. It had none of the deafening bluster of the cannonading so terrifying to new troops, but to those who had once experienced its effects, it was infinitely more to be dreaded. These volleys of musketry we were approaching sounded in the distance like the rapid pouring of shot upon a tinpan, or the tearing of heavy canvas, with slight pauses interspersed with single shots, or desultory shooting. All this presaged fearful work in store for us, with what results to each personally in the future, measured probably by moments, would reveal. How does one feel under such conditions? To tell the truth, I realized the situation most keenly and felt very uncomfortable. Lest there might be some undue manifestation of this feeling on my conduct, I said to myself, this is the duty I undertook to perform for my country, and now I'll do it, and leave the results with God. My greater fear was not that I might be killed, but that I might be grievously wounded and left a victim suffering on the field. The nervous strain was plainly visible upon all of us. All moved doggedly forward in obedience to orders, in absolute silence so far as talking was concerned. The compressed lip and set teeth showed that nerve and resolution had been summoned to the discharge of duty. A few temporarily fell out, unable to endure the nervous strain." "So the morning wore away and the fighting on the right ceased entirely. That was fresh anxiety -- the scales were turning perhaps, but which way? About noon the battle began afresh. This must have been Franklin's men of the Sixth Corps, for the firing was nearer, and they came up behind the center. Suddenly a stir beginning far upon the right, and running like a wave along the line, brought the regiment to its feet. A silence fell on every one at once, for each felt that the momentous 'now' had come. Just as we started I saw, with a little shock, a line-officer take out his watch to note the hour, as though the affair beyond the creek were a business appointment which he was going to keep. When we reached the brow of the hill the fringe of trees along the creek screened the fighting entire, and we were deployed as skirmishers under their cover. We sat there two hours. All that time the rest of corps had been moving over the stone bridge and going into position on the other side of the creek. Then were ordered over a ford which had been found below the bridge, where the water was waist deep. One man was shot in mid-stream. At the foot of the slope on the opposite side the line was formed and we moved up through the thin woods. Reaching the level we lay down behind a battery which seemed to have been disabled. There, if anywhere, I should have remembered that I was soaking wet from my waist down. So great was the excitement, however, that I have never been able to recall it. Here some of the men, going to the rear for water, discovered in the ashes of some hay-ricks which had been fired by our shells the charred remains of several Confederates. After long waiting it became noised along the line that we were to take a battery that was at work several yards ahead on the top of a hill. This narrowed the field and brought us to consider the work before us more attentively. Right across our front, two hundred feet or so away, ran a country road bordered on each side by a snake fence. Beyond this road stretched a plowed field several hundred feet in length, sloping up to the battery which was hidden in a corn field. A stone fence, breast-high, inclosed the field on the left, and behind it lay a regiment of Confederates, who would be directly on our flank if we should attempt the slope. The prospect was far from encouraging, but the order came to get ready for the attempt. Our knapsacks were left on the ground behind us. At the word a rush was made for the fences. The line was so disordered by the time the second fence was passed that we hurried forward to a shallow undulation a few feet ahead, and lay down among the furrows to re-form, doing so by crawling up into line. A hundred feet or so ahead was a similar undulation to which we ran for a second shelter. The battery, which at first had not seemed to notice us, now, apprised of its danger, opened fire upon us. We were getting ready now for the charge proper, but were still lying on our faces. Lieutenant-Colonel Kimball was ramping up and down the line. The discreet regiment behind the fence was silent. Now and then a bullet from them cut the air over our head, but generally they were reserving their fire for that better show which they knew they would get in a few minutes. The battery, however, whose shots at first went over our heads, had depressed its guns so as to shave the surface of the ground. Its fire was beginning to tell. I remember looking behind and seeing an officer riding diagonally across the field - - a most inviting target - - instinctively bending his head down over his horse's neck, as though he were riding through driving rain. While my eye was on him I saw, between me and him a rolled overcoat with its traps on bound into the air and fall among the furrows. One of the enemy's grape-shot had plowed a groove in the skull of a young fellow and had cut his overcoat from his shoulders. He never stirred from his position, but lay there face downward, a dreadful spectacle. A moment after, I heard a man cursing a comrade for lying on him heavily. He was cursing a dying man. As the range grew better, the firing became more rapid, the situation desperate and exasperating to the last degree. Human ature was on the race, and there burst forth form it the most vehement, terrible swearing I have ever heard. Certainly the joy of conflict was not ours that day. The suspense was only for a moment, however, for the order to charge came just after. Whether the regiment was thrown into disorder or not, I never knew. I only remember that as we rose, and started all the fire that had been held back so long was loosed. In a second the air was full of the hiss of bullets and the hurtle of grape-shot. The mental strain was so great that I saw at the moment he singular effect mentioned, I think, in the life of Goethe on a similar occasion - - the whole landscape for an instant turned slight red. I see again, as I saw it then in a flash, a man just in front of me drop his musket and throw up his hands, stung into vigorous swearing by a bullet behind the ear. Many men fell going up the hill, bit it seemed to be all over in a moment, and I found myself passing a hollow where a dozen wounded men lay - - among them our sergeant-major who was calling me to come down. He had caught sight of the blanket rolled across my back, and called me to unroll it and help to carry from the field one of our wounded lieutenants." David Thompson's and Frederick Hitchcock's accounts appear respectively in: Buel, Clarence, and Robert U. Johnson, ed., Battles and Leaders of the Civil War (1888; reprint ed., 1982) Hitchcock, Frederick, War from the Inside (1904). Additional sources: McPherson, James M., Ordeal by Fire: The Civil War and Reconstruction (1982), McPherson, James M., Battle Cry of Freedom: The Civil War Era (1988). "Carnage At Antietam, 1862," EyeWitness to History, www.eyewitnesstohistory.com (1997). General George B. McClellan commanded the Union Army. The Union victory at Antietam persuaded President Lincoln to issue his Emancipation Proclamation. Clara Barton, founder of the American Red Cross, made her first appearance as a volunteer nurse at Antietam. At one point, a stray bullet passed through her sleeve, killing a soldier she was caring for. Although the creek was shallow, General Burnside persisted in attempting to cross the bridge. It was not until late in the battle that he ordered his men into the water. The battle for the bridge began around 10 in the morning. 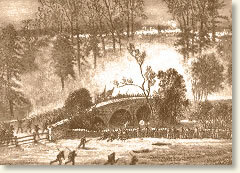 After two unsuccessful attempts, Union troops charged across the bridge around 1 in the afternoon. On November 7, Lincoln sacked General McClellan replacing him with General Burnside.